In a nutshell: Remove from ViewControllers all tasks which are not view-related. Need to have knowledge of other ViewControllers to pass state along. Difficult to test business logic tied to the view structure. The architecture adds a level of organization above the View Controller called the Coordinator layer. The Coordinator objects break the user flow of your app into discrete tasks that can be performed in an arbitrary order. Example tasks for a simple shopping app might be: Login, Create Account, Browse Content, Checkout, and Help. Each Coordinator manages the user flow through a single task. It is important to note that there is not a unique relationship between Coordinators and the screens they manage; multiple Coordinators can call upon the same screen as part of their flow. We want a Coordinator to completely define a task from beginning to completion, only changing to a different Coordinator when the task is complete or the user takes action to switch tasks in mid-flow. Rationalle: When View Controllers must be aware of their role within a larger task, they tend to become specialized for that role and tightly coupled to it. Then, when the same view controller is needed elsewhere in the app, the developer is faced with the task of either putting branching logic all over the class to handle the different use cases or duplicating the class and making minor changes to it for each use case. When combined with Model Isolation and Mindful State Mutation, having the control flow of the app determined at a higher level than the view controller solves this scenario, allowing the view controller to be repurposed more easily. View Controllers must define all of their data requirements in the form of a DataSource protocol. Every view controller will have a var dataSource: DataSource? property that will be its sole source of external information. Essentially, this is the same as a View Model in the MVVM pattern. Rationale: When View Controllers start reaching out directly to the Model or service-layer objects (API clients, persistence stacks, etc.) they begin to couple the model tightly to their views, making testing increasingly difficult. View Controllers shall define all of their external state mutations in the form of a Delegate protocol. Every view controller will have a var delegate: Delegate? property that will be the only object that the View Controller reaches out to in order to mutate external state. That is to say, the View Controller can take whatever actions are necessary to ensure proper view consistency, but when there is a need to change to a new screen or take some other action that takes place “outside” itself, it invokes a method on its delegate. Rationale: In the traditional MVC architecture, View Controllers become tightly coupled to each other, either by instantiating their successor view controller and pushing it onto a Nav Controller, or by invoking a storyboard segue and then passing model and state information along in prepareForSegue(). This coupling makes it much more difficult to test that the user flow of your app is working as expected, particularly in situations with a lot of branching logic. A global enum that contains a case for every possible user flow within the app. Each task should have its own TaskCoordinator. The ultimate source of truth about what state the app should be in. It manages the transitions between the TaskCoordinator objects. It decides which Task should be started on app launch (useful when deciding whether to present a login screen, or take the user straight to content). The AppCoordinator decides what to do when a Task completes (in the form of a delegate callback from the currently active TaskCoordinator). The AppCoordinator holds a reference to the root view controller of the app and uses it to parent the various TaskCoordinator view controllers. If not root view controller is specified, the AppCoordinator assumes it is being tested and does not attempt to perform view parenting. 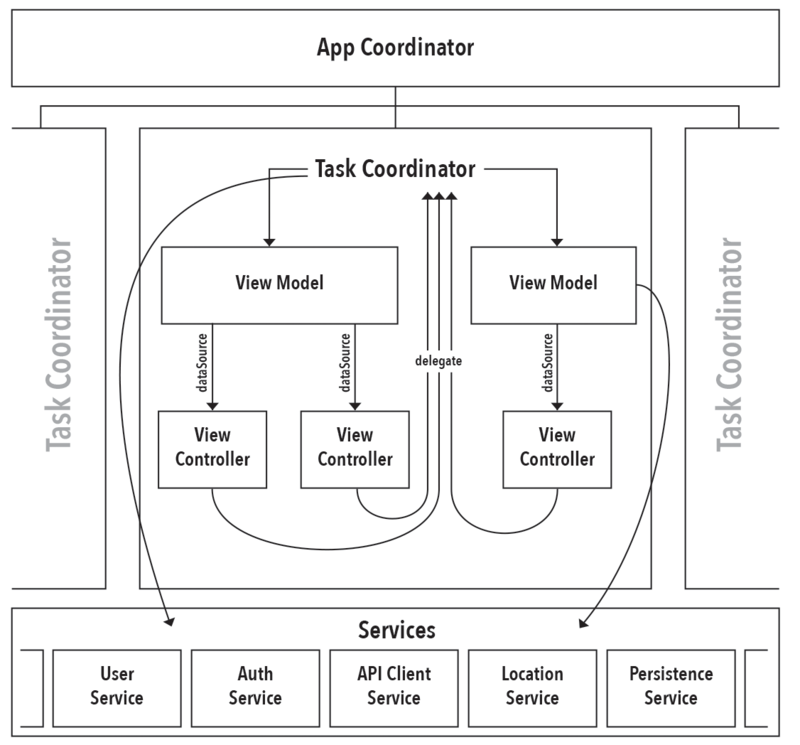 The AppCoordinatorcreates and retains the service layer objects, using dependency injection to pass them to the TaskCoordinators which then inject them into the ViewModels. Manages the user flow for a single Task through an arbitrary number of screens. It has no knowledge of any other TaskCoordinator and interacts with the AppCoordinator via a simple protocol that includes methods for completing its Task or notifying the AppCoordinator that a different Task should be switched to. TaskCoordinators create and manage the ViewModel objects, assigning them as appropriate to the dataSource of the varous View Controllers that it manages. Objects in the service layer encapsulate business logic that should be persisted and shared between objects. Some examples might be a UserAuthenticationService that tracks the global auth state for the current user or an APIClient that encapsulates the process of requesting data from a server. Service layer objects should never be accessed directly by View Controllers! Only ViewModel and Coordinator objects are permitted to access services. If a View Controller needs information from a service, it should declare the requirement in its DataSource protocol and allow the ViewModel to fetch it. Avoid giving in to the siren call of making your service layer objects as singletons. Doing so will make testing your Coordinator and ViewModel objects more difficult, because you will not be able to substitute mock services that return a well-defined result. If you want to do data/API response mocking—say because the API your app relies on won’t be finished for another couple of weeks—these objects are where it should occur. You can build finished business logic into your ViewModel and Coordinator objects that doesn’t need to change at all once you stop mocking data and connect to a live API. ViewModel objects are created and owned by TaskCoordinators. They should receive references to the service layer objects they require in their constructors (dependency injection). A single ViewModel may act as the DataSource for multiple View Controllers, if sharing state between those controllers is advantageous. ViewModels should only send data down to the View Controller, and should not be the recipient of user actions. The TaskCoordinator that owns the ViewModel and is acting as the View Controller’s delegate will mutate the ViewModel with state changes resulting from user actions. In the AppDelegate you can see the AppCoordinator being instantiated and handed the root view controller. In the AppCoordinator‘s init method, observe how it checks to see if the user has “logged in”. If the user is not logged in, the user is directed to the Login task to complete logging in. If the user is logged in, then they are taken directly to the Forecast task. When tasks have completed their objective, they call their delegate taskCooordinator(finished:) method. This triggers the AppCoordinator to determine what the next task is. In a fully-fledged app, there could be a considerable amount of state inspection as part of this process. No view controller should access information except from its dataSource (View Model). No view controller should attempt to mutate state outside of itself except through its delegate (usually a TaskCoordinator). No view controller should have knowledge of any other view controller save those which it directly parents (embed segue or custom containment). View Controllers should never access the Service layer directly; always mediate access through the delegate and dataSource. A view controller may be used by any number of TaskCoordinator objects, so long as they are able to fulfill its data and delegation needs. A big thank you to Soroush Khanlou and Chris Dzombak and their fantastic Fatal Error podcast for giving me inspiration to create this. Animate the properties of a CIFilter. Animate a number changing within a label. Animate ANYTHING which isn’t a UIView or CALayer property. There are some hacky solutions you can do such as making a custom CALayer subclass which uses a delegate callback to report the setting of some property. However, this is cumbersome to set up and maintain, so I created my own tweening library to fill in the gap. Tweener is a fairly simple class. It has static methods for creating tweens as well as pausing and resuming animation. At it’s core is a CADisplayLink which provides “ticks” that drive the animation. The core measures the elapsed time since the last tick and advances each of its child animations by that amount. This approach allows animation to finish in constant time, even when the frame rate is fluctuating. When the Tweener.tween(...) method is called, a new instance of Tweener is created and returned. Simultaneously, it is added to the internal array of managed instances so that it can receive ticks. If the CADisplayLink is paused, it is unpaused. With each tick, the individual Tweener instances are told how much time has elapsed. They, in turn, calculate how far along through their duration they are and update their progress closures appropriately. If a Tweener instance determines that elapsed time has equaled or exceeded its duration, it calls its completion closure (if it has one) and flags itself as complete. At the end of every tick, the Tweener class scans its instances and removes the completed ones. If the number of active instances is reduced to zero, then the CADisplayLink is paused. There is only one class file to include in your project, available here. I also have a very simple example project for you to look at. Performance – It seems to work pretty well, but I’ve not done extensive testing on the tick methods to ensure maximum efficiency. Additional Easing Functions – I only have two Easing families at the moment. There are dozens of variations documented online (see here), and adding a few more to the class would improve its flexibility. Online services and APIs are an inseparable part of most apps. Often they require the use of a secret key to identify the subscribing client, usually is in the form of a long string of alphanumeric characters. Invariably, it would be a bad thing™ for a malicious user to get their hands on this key. Perfect security is impossible, but there are some simple steps you can take to make it more than trivially easy for snoopers to extract your API keys from your app. Strings looks for ASCII strings in a binary file or standard input. Strings is useful for identifying random object files and many other things. A string is any sequence of 4 (the default) or more printing characters ending with a newline or a null. Total: %ld. Fav: %ld. Unfav: %ld. Invalid state: version exists in both favorite and unfavorite sets for action. In the case of the Photos app, strings found 38675 string candidates. A lot of them were garbage, and there were literally thousands of Objective-C selectors, but there were also a lot of strings that were obviously never intended for user consumption. If it’s a string in your code, it will be found by strings and you can bet that someone snooping for API keys has pattern matching schemes that will make them trivial to find. The easiest way to prevent Strings from finding your API keys is simply to not include them as strings. However, do not think that putting a sequence of ASCII bytes into an array is going to help you, if your array’s bytes match the ASCII codes for the characters, you’ve just made a cumbersome string and it will probably still be detected as such. Invert the bytes by subtracting them from 255. So, a value of 10 becomes 245 and a value of 50 becomes 205, etc. Note: this is identical to using XOR with a nonce of 255. 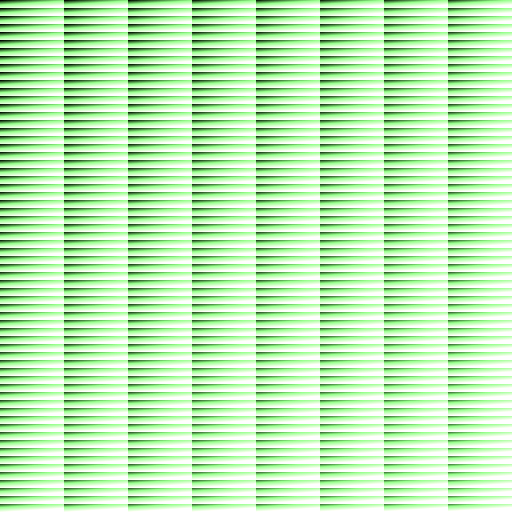 XOR each byte with a single-byte “nonce”, which is just random number between 1 – 255 (XOR with 0 produces no change). XOR is a reversible operation: if you XOR with a given byte twice, you end up with your original value. In practice, you’d want to pick a nonce byte that has at least 3 of the 8 bits as 1s to ensure sufficient mutation of your API key bytes. Then you would simply store the converted bytes in your app instead of the string and convert it back to the string by reversing the operation at runtime to produce the original string. If you are using the single-byte XOR approach from above, your API key would be safe from a simple strings search, but there are still only 254 ways you can possibly obfuscate the string and a really determined snooper might still be able to find it. Let’s make their job exponentially harder and use a multi-byte nonce! The basis for this approach is a new Sequence type I created called RepeatingSequence. The general idea is that it initializes with any collection type and returns the elements in sequence, wrapping back to the first element once the last one has been emitted. This lets us use a sequence of random bytes instead of just one. I created a Playground that you can use to generate a multi-byte nonce and use it to encode a string. Then, just include the byte array it prints out instead of the string in your app. This code is pretty simple to incorporate into your workflow and can give you a lot of peace-of-mind that your app’s API keys won’t be trivially easy to steal. A protocol named Doable that defines the doSomething() method. A default implementation for the doSomething() method in a protocol extension. A base class that conforms to Doable, but does not implement the doSomething() method itself. A sub-class inheriting from the base class which provides a custom implementation of the doSomething() method. An array of mixed base and subclass instances that is type [Doable]. The results of invoking doSomething() on all elements of the array may surprise you. When the for loop / reduce / whatever invokes doSomething() on a member of the array which is a subclass, you will not get the subclass’ custom implementation. Instead, you will get the default implementation! When the runtime goes looking for doSomething() on the current object (of type Doable) in the loop, it looks to the object which actually conforms to the Doable protocol, which is the base class. The runtime checks to see if the class implements the method, and when it sees that the base class does not, it falls back to the default implementation, rather than seeing if the subclass implements it. Apparently, the subclass is only checked in instances where it is overriding a method explicitly defined on its superclass. Provide an implementation of doSomething() on the base class. It can just be a duplicate of the default implementation, if that’s the behavior you want for it. Change the subclass’ doSomething() implementation to include an override declaration. The CIColorCube filter is quite an interesting beast. It is incredibly hard to set up properly, given the odd data requirement, but can recreate very complex color effects efficiently. The cube data is a NSData / Data object containing a sequence of floating-point color values where the red, green, blue, and alpha channels are represented not by the usual 8-bit UInt, but by 32-bit Floats. This is Core Image’s internal working color format, which allows much greater precision when mixing colors and prevents rounding errors. The size of the NSData must be precisely (size^3 * 4 * sizeof(CGFloat)) bytes where size is one of the following: 4, 16, 64, or 256. That is to say, the width * height * depth * 4 color channels * the size of a CGFloat. In the color table, the R component varies fastest, followed by G, then B. 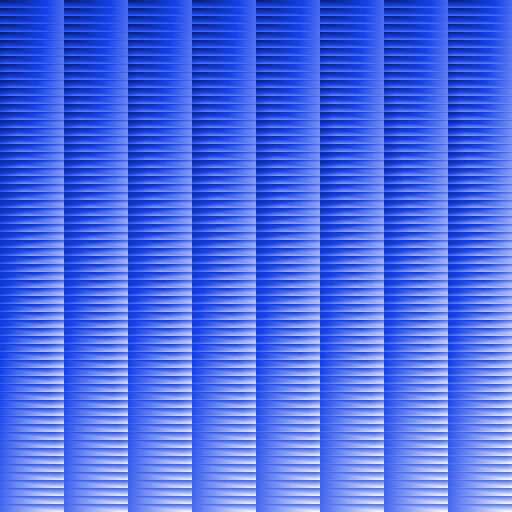 Certainly not your standard spectrum image, but it’s designed for Core Image’s consumption not our aesthetic enjoyment. One major problem encountered working with cube data as NSData / Data is that it is quite large. 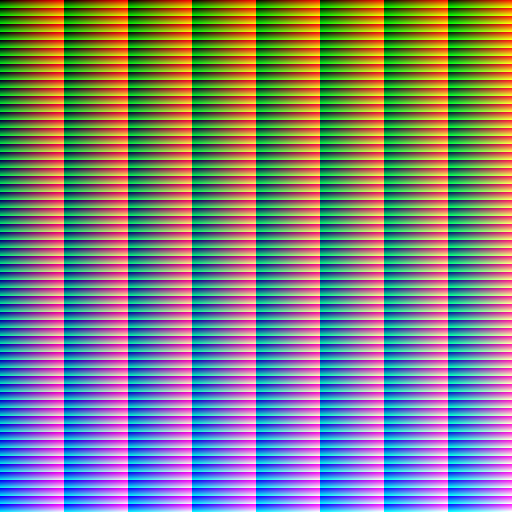 Color cube data with a dimension of 64 requires (64 * 64 * 64 * 4 * 4) = 4,194,304 bytes or 4 megabytes. Each color cube you store in your app consumes 4MB of storage, which is pretty excessive! Luckily, there is a better way. While storing the color cube data as CGFloats might be more precise, it is almost never necessary to have that level of precision when defining a color effect. We can use PNG images to encode the data for the color cube in a much more efficient format. For example, the reference image I included above (which is for a size 64 cube) occupies only 8kB on disk! The other primary benefit of storing the data as a PNG is that we can use readily-available bitmap editing programs like Photoshop to modify them. This is crucial unless you want the Color Cube filter to produce output that looks identical to the input. The next step is to create a color effect. You can use any kind of color transformation you like on the reference bitmap. 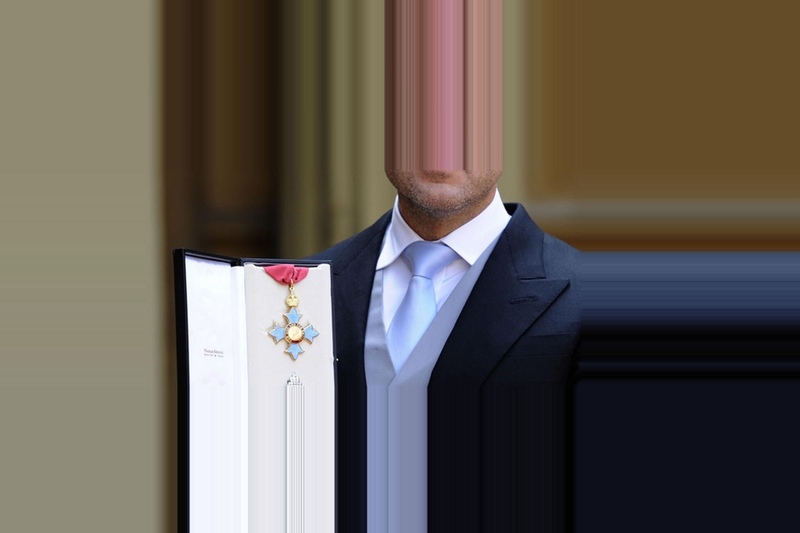 It is important not to use any distortion, blurring or other kinds of filters that would change the layout of the pixels, unless you’re interested in some extremely glitchy looking results. This is a very high-contrast B&W filter, approximating having a deep-red filter on the camera using black and white film. 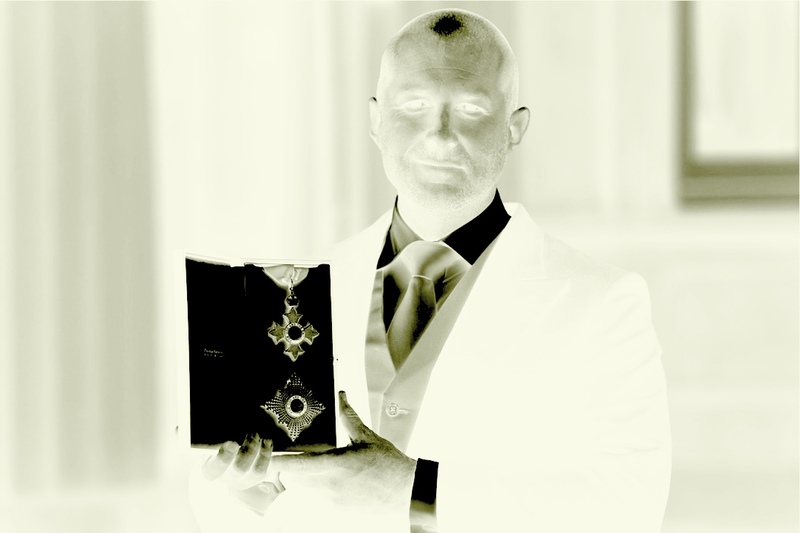 This is an inverted B&W filter which recreates the “hot black” infra-red view of a scene. Changes the whole scene to shades of blue, as in a cyanotype photograph. Changes things to a low-contrast green filter that approximates the view through night vision goggles. The only limit for creating your effect is what you can imagine and accomplish without any pixel rearrangement. The usage is simple; at runtime, simply pass the static method your effect PNG as a UIImage and the color cube size that you’re using. The class will validate the image size and then attempt to convert the 8-bit per-channel PNG data into the 32-bit per-channel format that is required by Core Image. Once the filter has been created, you can use it with whatever input image you want, including video input. Color Cube is a very performant filter, so it is a fantastic way to include color transformations into a filter stack. Unlike the tidal wave of new filters we saw in iOS 9, we only get 6 new filters in iOS 10. 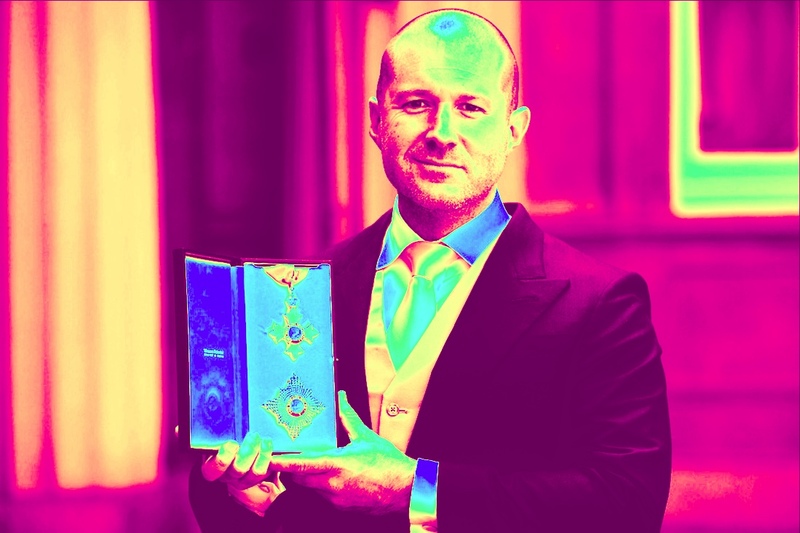 Here is our source image, a fetching portrait of Sir Jony Ive receiving his knighthood. Click any of the images to view the full-sized version. CIClamp is very similar to CIAffineClamp, except without the applied Affine Transform. The main input parameter is a rect which defines the image region which is unmodified. 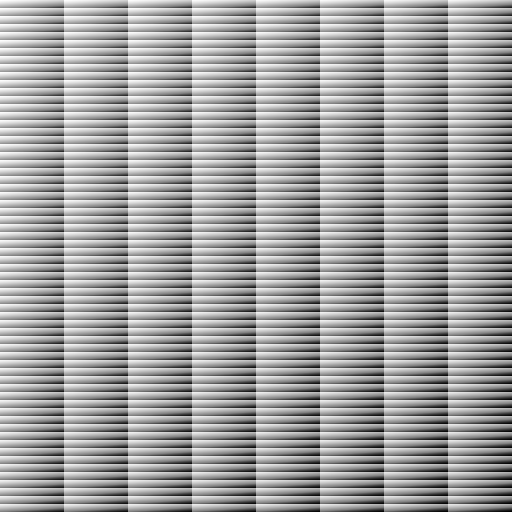 Everything outside that rect is just repeated edge pixels. This filter is capable of producing a color wheel of arbitrary size. Input parameters include the radius of the wheel and the color space used. Very handy if you want to create a color picker tool in your app. 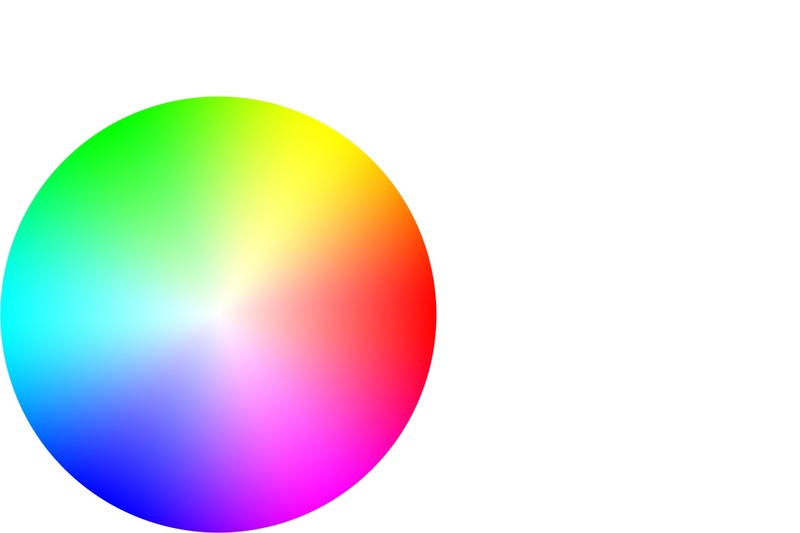 Note: The color wheel is bottom-left aligned within the image bounds because Core Image’s origin point is the bottom-left corner, not the top-left corner as in UIKit. Specify a 9-part region in an image and it can be scaled up just like the image slicing in the Asset Catalog. 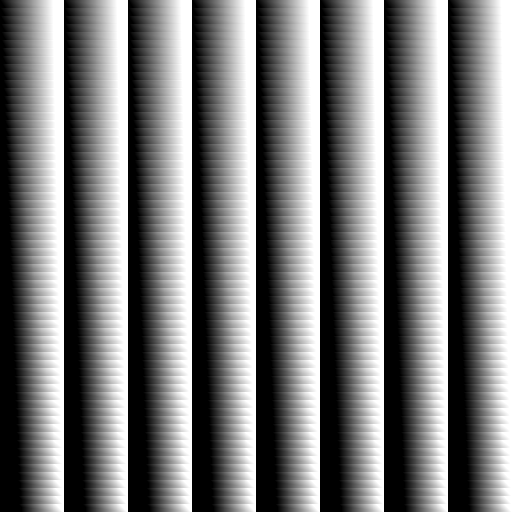 Similar to above, the slice pixels are tiled rather than being stretched. This would be more applicable to things like custom interface frames than photographs of people. Available for years as part of the Photo Booth app, developers now have access to the faux thermal imaging effect. Also a long-time part of Photo Booth, the faux X-ray filter is now available to everyone. Swift 2 provides a number of ways to indicate a problem in a method that returns a value, but the two most common are optional return values and throwing errors. Which you choose comes down to your requirements for a particular function, which I will discuss below. But if you take nothing else away from this post, take this: Don’t use both! That is not to say you can’t use both approaches in your app, just don’t use them both in a single function. The most common method for indicating failure in a function that returns a value is to make that value optional and return nil when a problem occurs that prevents the successful completion of the function. This has been available since Swift 1.0 and the language has a lot of syntactical features to allow you to efficiently detect and handle nil responses. Optional returns should be your first choice when all you care about is whether or not a value was returned from a function, not why the function may have failed. Swift 2 introduced a robust error handling mechanism to Swift. Functions marked with throws can throw errors which calling objects must explicitly handle or ignore. Having a well-defined set of errors allows calling objects to implement an intelligent recovery plan in the event of a failure, such as correcting erroneous input and trying again. The down-side is that writing error handling code gets verbose, with the do-catch blocks. Don’t! If you don’t want to bother with errors, then your method should just return an optional value. If you do go to the effort of adding errors, let them communicate problems and guarantee a non-nil return value from your function. If the calling object doesn’t want to handle the errors, it can simply invoke your function with try? and treat the return value as optional. If the calling function does handle the errors, allow it to forgo the extra steps of handling optional return values. Just how expensive is creating an NSDateFormatter? I didn’t put the code directly into the playground because doing ANYTHING in a playground 100k times is going to take a very long time and not be very representative of real-world conditions. The results were unequivocal: creating an NSDateFormatter each time you need to use it is roughly 9x slower than creating it once and using it repeatedly. That said, this is only likely to be an issue for tasks where there is a lot of date formatting going on, such as in a table view with dates in every cell. If you have a situation where you only need to format a single date infrequently (today’s date in a page header, for example), then you shouldn’t worry about hanging on to the date formatter; even though it’s heavy, it only takes a tiny fraction of a second to instantiate one. Addendum: At the request of a coworker (@rexeisen), I added in a test of the static NSDateFormatter. localizedStringFromDate(_:dateStyle:timeStyle:) test. As you can see, the results are no better than creating an instance each time. That said, it would be more convenient to use for 1-off formatting tasks, where keeping the formatter around is unnecessary. Addendum II (2016-01-15): Further testing has revealed that changing the timeStyle and dateStyle of an NSDateFormatter is tremendously expensive. Even more so than just creating a new formatter for each use! Across several trials, performance using a single NSDateFormatter that is re-parameterized on each use was 10% slower than creating a new formatter each time and a full 10x slower than using a single, pre-configured formatter. The take away here is, create a formatter for each repeating case, don’t try to make a single shared formatter do all the work. Don’t reference other IBOutlet views or implicitly unwrapped properties in your didSet block. The reason for this is simple: you have no way of knowing which order your IBOutlets will be set in, so the other view or property you’re trying to access may not be there. At best, you’re going to be nil-checking a lot and end up only partially configuring your views, requiring follow-up elsewhere in code. At worst, you’re going to accidentally force-unwrap a nil and crash your app. It’s okay to reference external objects, as seen in the call to the StyleManager above, as long as they’re non-optional and not subject to race conditions. The proper place to establish things like view layout relationships or properties from one view that copy the properties from another is still in viewDidLoad. Avoid [unowned self] whenever possible! One of the confusing aspects of Swift is how capture semantics work with closures. When used improperly, they can result in retain cycles or crash the app with the dreaded EXC_BAD_ACCESS. It is worth keeping in mind that capture semantics only apply to reference-based objects (classes); value objects can be used freely without worrying about this. The situation I’ll be looking at here is the capture of self, which is far-and-away the most common situation. Many asynchronous processes such as API calls include a completion closure, and the most common way to provide it is as an inline closure. In this example, we’re storing the API request object that is created by the call to our API client so that we can allow the user to cancel the request if it’s taking too long. Let’s assume this code appears in our LoginViewController class. Right, now we definitely don’t have a strong reference to self! However, users are reporting the app is crashing when login is taking too long and they leave the screen before it completes. Looking at the crash logs, you see a rash of EXC_BAD_ACCESS events occurring. Because you declared self was unowned, it was deallocated when the users left the screen, but when the API call completed, it attempted to call the methods referenced in the closure to disastrous effect. Using unowned as a capture semantic is the equivalent of force-unwrapping an optional. It’s never a great idea and should only be done when you are 100% sure there’s no chance the captured object will be deallocated before it is invoked. When you’re dealing with long-running asynchronous tasks like API requests, this is a bad bet unless the originating class is a singleton or some other pattern which will guarantee the object exists for the lifetime of the app. The secret sauce is line 4, where we guard against the possibility that the LoginViewController was deallocated prior to the API request completing. If self no longer exists, it doesn’t care about the API result, and we can bail out of the closure right away. We simply use the strongSelf reference for the remainder of the closure to avoid unwrapping self at every step and we’re good to go!